Brazil, South America’s largest economy, has a unique set of circumstances when it comes to addressing climate change. Home to much of the Amazon, its largest source of emissions by far is land-use change and the forestry sector. Brazil also uses large amounts of biofuels in transport and generates more than 70% of its electricity from hydropower. Brazil is one of the five major emerging “BRICS” economies and has the world’s sixth largest greenhouse gas (GHG) emissions. Brazil increased the ambition of its climate efforts in the lead up to the Paris climate change summit. However, turbulent events in Brazil, including a presidential impeachment, a widespread economic crisis and a major political corruption scandal, have led to concerns that progress on climate and energy policy is slowing. Graphic by Rosamund Pearce for Carbon Brief. In 1988, following 24 years of military rule, democracy was re-established in Brazil. In recent years, however, it has been beset by a major political corruption scandal and economic downturn. Dilma Rousseff, of the centre-left Workers’ party, was elected president for a second term in October 2014. However, she was impeached in August 2016 for allegedly manipulating government accounts ending 13 years of rule by the party. Her term was also overshadowed by a bribery scandal and a severe recession. Hundreds more Brazilian politicians have been investigated or charged with corruption. Michel Temer, vice-president under Rousseff and chairman of the centre-right PMDB party, who was confirmed as the new president in 2016, was last year formally chargedfor taking bribes from meat-packing giant JBS. While he avoided his corruption trial, he is now again being investigated for another alleged case of bribery. Since coming to power, Temer has also provoked concern over a roll-back of environmental and land protections and indigenous peoples’ rights. In particular, some fear an announcement in April last year to cut the government’s environment budget by 43% could hinder efforts to stem deforestation. Concerns have also been expressed that the Temer government is inviting an “oil frenzy” by giving companies a package of major tax breaks. The then Brazilian vice president Michel Temer speaks to the media in Brasilia, Brazil, 11 April 2016 . Credit: Agencia Brasil / Alamy Stock Photo. National elections are scheduled in Brazil for 7 October 2018. Unemployment sits at around 12% in Brazil, although the economy has shown signs of recovery after a four-year recession. Despite this economic turndown leading to a fall in energy use, Brazil’s emissions rose by 9% in 2016, driven largely by a spike in illegal deforestation. Agribusiness has become increasingly important in the struggling economy, in turn leading to an increase in the political power of wealthy landowners. The so-called “bancada ruralista” (rural caucus) now controls more than half of Brazil’s congress. In these uncertain times, environmental and climate policies are not a key focus of political discussions in Brazil. However, Brazil is also proud of its place on the world stage as a protagonist on climate change, while polls show Brazilians are highly concerned about climate change. Brazil has also put in a bid to host COP25, next year’s UN climate conference, which is scheduled to be hosted in Latin America and the Caribbean. During international climate talks at the United Nations Framework Convention on Climate Change (UNFCCC), Brazil sits in the “BASIC” (Brazil, South Africa, India and China) negotiating bloc, as well as the “G77 + China” bloc. Brazil’s climate pledge (“nationally determined contribution”, or NDC), submitted to the UN in the lead up to the Paris climate change conference in 2015, targets a 37% cut in greenhouse gas by 2025 compared to 2005 levels. Brazil also pledged an “indicative” 2030 target to achieve a 43% reduction in emissions compared to 2005. Representatives from BASIC countries shake hands after a joint press conference at COP23 in Bonn, Germany, in 2017. From left to right: Indian environment minister Harsh Vardhan; Brazilian environment minister José Sarney Filho; Chinese lead climate negotiatior Zhenhua Xie; and South African environment minister Bomo Edna Molewa. Brazil’s NDC makes it the only large developing nation to have promised an absolute reduction in emissions. In contrast, many developing countries – including India and China – offered only to peak their emissions by a certain date, or to cut their emissions compared to a business-as-usual (BAU) trajectory. The pledge represented an adjustment in Brazil’s stance at the UN climate negotiations, where it had previously argued developing countries with low historical emissions should have more leeway in emissions cuts. In 2010, as part of the Copenhagen accord, it pledged only a reduction compared to a BAU scenario. However, according to government data cited in its NDC, Brazil’s emissions were already well below 2005 levels when it made the pledge, largely due to a steep fall in deforestation rates. The data showed Brazil’s emissions stood at 1.2bn tonnes CO2 equivalent (CO2e) in 2012, a 41% drop compared to 2005 levels. Therefore, Brazil’s emissions already stood near its 2030 NDC target in 2012, while its target for 2025 actually allows for an increase in emissions. Brazil’s NDC also represents a reduction in per capita emissions. Brazil’s population currently sits at around 210 million and is projected to reach 229 million by 2035. According to the pledge, per capita emissions are set to fall from 6.5 tonnes of CO2 equivalent (tCO2e) in 2012 to 6.2tCO2e in 2025, taking into account the projected risein population. A further drop to 5.4tCO2e will be seen by 2030, the pledge says. Brazil pointed out in its Paris pledge that even its 2012 per capita GHG emissions of 6.5tCO2e were already at what some developed countries consider fair for their own to be in 2030. It’s worth noting that Brazilian trade was a slight net importer of CO2 emissions in 2014, although the “embodied” methane emissions exported via Brazil’s large beef exports is not included in this CO2-only figure. Climate Action Tracker (CAT) rates Brazil’s Paris pledge as “insufficient”, meaning it is not consistent with the Paris Agreement’s goal to limit warming to below 2C, let alone its intention to limit it to 1.5C. CAT argues Brazil’s pledge is at the “least ambitious end” of a fair contribution to global mitigation. Brazil needs to reverse its current trend of weakening climate policy, strengthen implementation in the forestry sector, and reverse present plans to expand fossil fuel energy sources, it adds. The International Energy Agency (IEA) has projected Brazil’s CO2 emissions will increase in the decades to 2040 unless new policies are introduced to support and build further on its Paris pledge. Brazil’s GHG emissions increased by 9% in 2016, according to NGO Observatorio do Clima, driven by an increase in Amazon deforestation. Brazil accounts for 23% of the world’s biofuel production, second only to the US, which produces 44%. This come largely from sugarcane, although soy, maize and palm oil are also used. Biofuel use is mainly in Brazil’s rapidly expanding vehicle fleet, supported by years of tax incentives and policies to promote its use. As shown in Carbon Brief’s interactive infographic above, only around 15% of Brazil’s overall greenhouse gas emissions came from transport in 2014, and the sector’s emissions fell slightly in 2015 and 2016. However, Brazil’s vehicle fleet is also expandingrapidly, with air pollution, partly from transport, remaining a significant problem in the country. The vast majority of new cars sold in Brazil today are capable of running on pure ethanol, a gasoline-ethanol blend, or any mixture of both. Around 60% of the country’s light vehicle fleet is now made of these “flex fuel” vehicles, which allow owners to switch freely between a gasoline-biofuel blend and pure biofuel depending on their price at the pump. These were first introduced in Brazil in only 2003. Pure gasoline is no longer sold at pumps in Brazil, since it has had an ethanol-use mandate since 1977. This dictates the minimum amount of bioethanol required to be blended with gasoline and is currently set at 27%. For comparison, the UK’s biofuel-use target currently sits at 4.75%, while the EU has mandated a 10% blend for 2020. Meanwhile, Brazil’s national biodiesel programme, created in 2004 to promote domestic production, mandates that diesel fuel should be composed of 8% biodiesel. This is set to increase to 10% in March 2018. Last year, Brazil passed a new biofuels law to further increase the use of biofuels based on emissions reduction certificates, set to begin in 2020. Man working with sugarcane, Rio de Janeiro, Brazil. Credit: Tim Moore/Alamy Stock Photo. 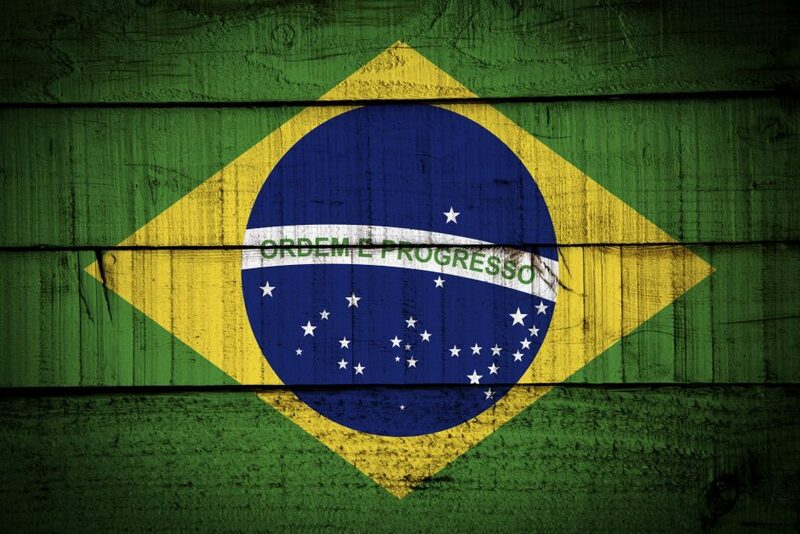 Brazil’s Paris pledge promises to increase the share of bioenergy – which includes biofuels and bioelectricity – in its overall energy mix to around 18% by 2030. Figures quoted by the Brazilian energy ministry in December 2017 indicate Brazil may have already reached this target. However, uncertainties remain about how much further expansion of biofuels is possible, given constraints, such as the competing demand for animal feed, climate change impacts and protection of natural ecosystems. Concerns centre on the fear that higher biofuel production could lead either directly or indirectly to more land clearing. In addition, nitrogen fertiliser used in growing sugarcane for ethanol currently leads to significant emissions of nitrous oxide (N2O), a powerful greenhouse gas. One recent Nature study, however, found there was substantial potential for sugarcane biofuel to expand in Brazil over the coming decades, while also protecting forests under conservation and accounting for increases in food and animal feed production. It foundsuch an expansion of Brazilian sugarcane could reduce global CO2 emissions by as much as 5.6%. Around 60% of Brazil’s land area is covered by forests. Overall, the country is home to 13% of the world’s forested area. Two-thirds of the world’s largest rainforest, the Amazon, lies in Brazil. Brazil has a wealth of other forests, such as the Atlantic Forest, which has been 85% deforested, but is still the second most diverse ecosystem on the planet after the Amazon. Brazil is also home to much of the Pantanal region, the world’s largest tropical wetlands, which holds one of the greatest concentrations of wildlife on Earth and is threatened by agricultural expansion. Brazil’s “Forest Code” law – first passed in 1965, but revised many times then replaced in 2012 – required landowners to maintain a minimum percentage of their property under native vegetation, typically 80% in the Amazon. However, this law has provenhard to implement and monitor. Brazil has struggled with deforestation for years. Emissions from the land use, land-use change and forestry (LULUCF) sector accounted for the majority of the country’s GHG emissions for decades until 2005, but the country saw a huge decline of around 70% in the decade after this. LULUCF emissions had comelargely from illegal deforestation. LULUCF still accounts for around a fifth of Brazil’s emissions. Illegal and legal deforestation, driven by cattle ranching, soy production for livestock feed and logging for timber and charcoal, continues to be a significant problem in Brazil today. Cropland bordering rainforest habitat (aerial), Iguacu National Park, Brazil. Credit: Frans Lanting Studio/Alamy Stock Photo. After 2005, deforestation in Brazil fell significantly for a decade, but in recent years has again shown increases. Deforestation fell again by 16% in the year to July 2017 – the first decline in three years – but still remains well above 2012 levels. Concerns continue that the “ruralista” bloc in Brazil’s congress has been using the disruption in the political system to push through legislation to reverse rainforest protections. Last June, Norway told Brazil it would cut its billion-dollar financial assistance to protect the Amazon if rising deforestation there was not reversed. Deforestation in Brazil has major implications for the balance of CO2 in the global atmosphere. A major study released in 2015 found the amount of carbon being absorbed and stored by the Amazon rainforest had fallen by around a third over the previous decade. Another recent study found large carbon losses in Brazil and elsewhere are contributing to tropical forests turning from a global sink to a global source of emissions. Brazil pledged in its NDC to achieve “zero illegal deforestation” in the Amazon by 2030. However, this represented a step backwards from its proposal in 2008 to achieve “zero net deforestation” by 2015. Brazil has also promised to restore 12m hectares of deforested land by 2030 – the biggest commitment of its kind ever made by a single country. Last year, Brazil launched a centralised database to monitor individual trees through the supply chain to help combat illegal logging in the Amazon. It has also suggested it may begin paying landowners to maintain more of their land in its natural state. Agriculture is an major part of Brazil’s economy. The country’s farmland increased by quarter over the past decade and the sector accounted for 46% of Brazil’s exports in 2016. It was also one of the few sectors to grow in 2017 despite the recession. This has led to agricultural interests having a strong representation in the Brazilian congress and considerable influence over President Temer. As well as CO2, the agricultural sector emits large amounts of nitrous oxide (N2O) and methane (CH4). The sector is currently the largest source of overall GHG emissions in Brazil, with a 34% share. Methane emissions are Brazil’s second largest sources of emissions after CO2, accounting for almost a third of its total greenhouse gas emissions. Cattle are the country’s largest source of methane emissions, which are expected to continue to risewith future growth in Brazilian beef production. However, Brazil argues in its NDC that calculating CO2e of methane in a different way would lower the importance of methane. In addition to its deforestation pledge, Brazil has committed to restoring 15m hectares of degraded pasturelands by 2030 and enhancing 5m hectares of systems integrating the crop, livestock and forest components together by 2030. However, its NDC has no mention of reducing methane emissions from cattle. Brazil has one of the largest renewables sectors in the world, with three-quarters of its electricity supply coming from renewables including hydropower in 2015. The chart below shows the sources of Brazil’s electricity generation up to 2014. Sources electricity production in Brazil, 1985-2014. Source: World Bank World Development Indicators for breakdown between different sources; BP Statistical Review of World Energy 2017 for total electricity generation values. Chart by Carbon Brief using Highcharts. Brazil’s NDC outlines plans to boost the share of renewables in its overall energy mix to 45% by 2030, up from 40% in 2015. It indicates around two-thirds of this should come from renewables other than hydro. It also wants to reach 23% of non-hydro renewables in its power mix by 2030, as well as making the electricity supply 10% more efficient. In December, Brazil released its 10-year energy plan. While this has a focus on rapidly expanding renewables, it also expects nuclear, gas and coal to grow slowly, while oil production is expected to double by 2026. Wind power is fast growing in Brazil, with 10.6GW installed capacity by the end of 2016 and a further 24% increase 2017. Brazil’s 10-year plan aims to increase capacity to 28.4GW by 2026, around 12% of its power mix. A government auction for new power plants held last December – the first in two years for wind firms due to the recession – awarded 1.4 GW of wind capacity out of total contracts of 4.5GW. The auction saw record low prices for wind power. As the chart shows, solar power is still a fairly nascent industry in Brazil. However, it is beginning to expand. It was awarded contracts for 0.6GW in the December auction, while Brazil’s energy plan aims to have 9.6GW of installed capacity by 2026. Brazil’s energy demand is set to expand significantly over the coming decades, with demand for all fuels likely to increase. Brazil is the world’s second largest hydropower producer after China. Hydropower provides more than two-thirds of the electricity in Brazil and met 11% of total energy demand in 2016. In particular, the enormous Itaipú hydroelectric dam, a 50:50 project jointly owned with neighbouring Paraguay, was extended to 14GW capacity in 2006/2007. It produced around 17% of Brazil’s (and 76% of Paraguay’s) electricity in 2016. Hydropower plant, Buritama, Brazil, 2012. Credit: Pulsar Imagens / Alamy Stock Photo. 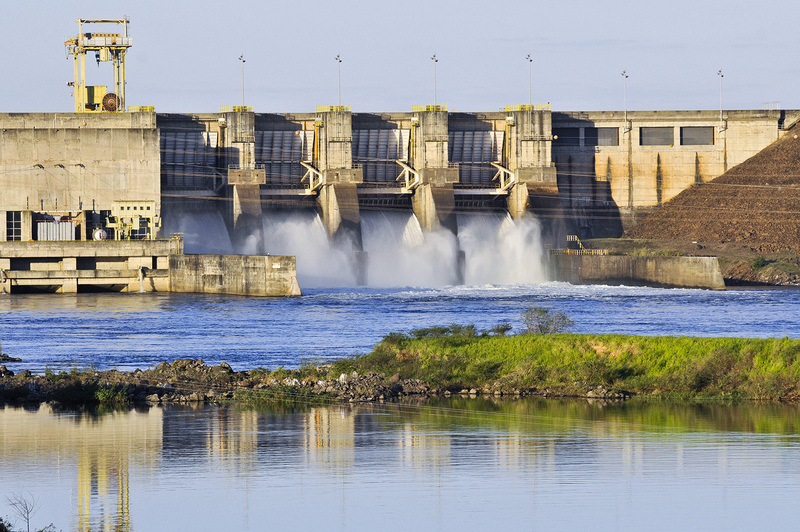 Brazil’s government has plans for development of a further 100 or so hydroelectric projects. However, these massive hydropower dams have in some cases proved costly in both human and environmental terms, provoking wide opposition. The 11,000 megawatt (MW) Belo Monte Dam, which is set to be the country’s second largest after Itaipú, has been beset by controversy and delays due to several federal court battles over its impact on local indigenous communities and the environment. Meanwhile, the planned 8,000MW São Luiz de Tapajós Dam was effectively cancelled in 2016 following opposition from indigenous communities. The government’s recent energy plan included several large hydropower projects in the Amazon region. However, in January 2017 a senior official indicated a possible shift away from building mega-dams in the Brazilian Amazon. Brazil has large oil reserves and is currently the world’s ninth-largest petroleum producer. Most of its reserves are found offshore. Brazil’s majority state-owned oil firm Petrobras discovered the country’s “pre-salt” oilfields in 2007, the largest deepwater offshore oil find in decades. Despite strong support from both Rousseff and Temer, pre-salt oil extraction remains under debate in Brazil due to its impact on the climate, fears over a repeat of the Deepwater Horizon oil spill and how it could affect local fisherman. People in Rio de Janeiro protesting against oil and gas drilling in the Amazon on 29 September 2017. Credit: Ellen Pabst dos Reis / Alamy Stock Photo. Brazil held several international auctions in 2017 for its oil, with bidders including oil majors, such as Shell and Statoil. Meanwhile, Exxonmobil emerged as the biggest winner in an auction last October for oil blocks outside the pre-salt area. It won 10 blocks in its bid and six in consortia with majority-state owned oil firm Petrobras for the offshore Campos basin off the coast of Rio de Janeiro. Oil giants BP and Total also want to drill in the region near the mouth of the Amazon river. The proposition, which would entail drilling near to the Amazon reef (which was only widely revealed to scientists in 2016) faces public opposition and a campaign against it by Greenpeace. Brazil’s environmental regulator, Ibama, has also repeatedly rejected Total’s environmental impact studies for drilling in the region, with its decision on Total’s latest submission due in the first half of 2018. A recent report from the International Energy Agency (IEA) recently cited Brazil as one of the four countries, along with the US, Norway and Canada, that it expects to contribute to oil supply growth in the coming few years. The chart below shows how the IEA forecasts growth in Brazilian oil supply up to 2023. Brazil’s 1988 constitution includes a chapter on the environment, where it says “the government and the community have a duty to defend and to preserve the environment for present and future generations”. In 2009, Brazil established its National Policy on Climate Change (NPCC) to underpin efforts to tackle its emissions and adapt to climate change. This followed the country’s 2002 climate law known as PROINFA, which aimed to incentivise electricity generation from wind, biomass and small hydroelectric. In a major ruling last month, Brazil’s Supreme Court upheld the country’s new Forest Code, passed in 2012, which included major changes to forest protection laws. The court had been asked to judge whether the code infringes the country’s constitution, but found it does not. The code includes an amnesty programme for illegal deforestation that occurred before 2008 on “small properties” in a move environmentalists warned would make illegal deforestation more culturally acceptable. Brazil is expecting several other environmental court rulings in 2018. The government has in recent years explored the possibility of using a national emissions trading scheme (ETS). However, no scheme is yet in place. Both Rio de Janeiro and São Paulo have also considered implementing statewide trading schemes, while a group of companies have been participating in a voluntary ETS simulation since 2013. Brazil’s biologically diverse ecosystems make it vulnerable to climate change, with both the Atlantic and Amazon forests facing significant risks. Conservationists have warned that Brazil’s coral reefs, mangroves and coastal habitats could also be threatened by climate change. Coral colonies called Mussismilia braziliensis, an endemic species to the Abrolhos National Marine Sanctuary, Bahia Brazil. Credit: Andre Seale / Alamy Stock Photo. Brazil also suffers from a number of diseases spread by mosquitoes, such as dengue fever, Zika virus and malaria, which researchers are concerned could be exacerbated by climate change. Research has shown that extreme weather events, such as droughts, will become more frequent in the future due to climate change, although it was found to have “not [been] a major influence” on a severe drought in southeastern Brazil in 2014-15. In 2016, Brazil submitted its National Adaptation Plan to the UNFCCC, one of only nine countries – and the only large emitter – to have done this so far. The plan, which took three years to draft and stretches over some 500 pages, covers 11 sectors, including agriculture, biodiversity, disasters and mining. It aims to form a basis for strengthening Brazil’s adaptation capacity, assess climate risks and manage vulnerabilities. Analysis by Carbon Brief last year showed Brazil had received $109m between 2013 and 2016 (inclusive) from multilateral climate funds, one of the vehicles for distributing international climate finance for mitigation and adaptation. Brazil was the 14th largest recipient of such funds, the analysis found. Major projects included one on increasing the sustainability of cities and another on sustainable agriculture in Brazil’s Cerrado biome. Data for energy consumption comes from BP Statistical Review of World Energy 2017. Greenhouse gas emissions per capita in 2015 come from combining emissions data, including LULUCF, compiled by the Potsdam Institute for Climate Impact Research (PIK) and population data from the World Bank. 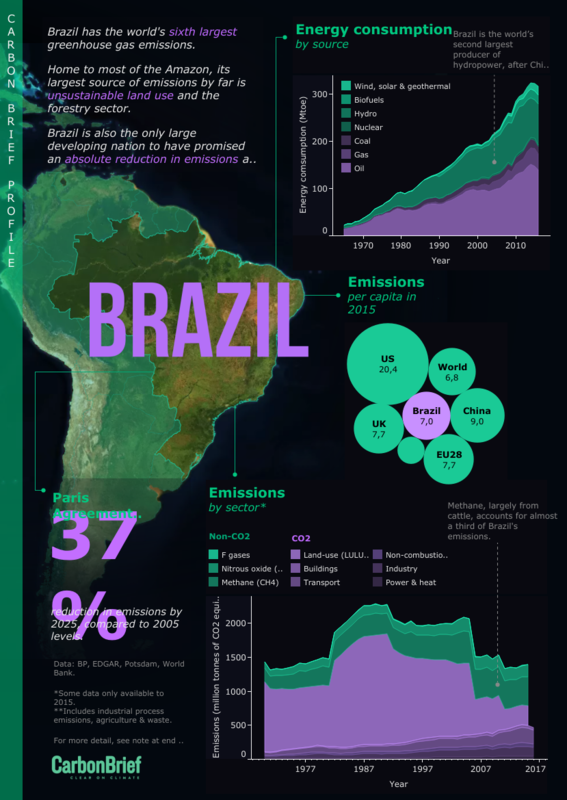 The PIK database also shows Brazil has the world’s sixth largest greenhouse gas emissions (inc LULUCF). Brazil’s pledge to reduce emissions by 37% by 2025 compared to 2005 levels comes from its NDC submitted to the UN in 2015.The graph showing emissions by sector comes from combining two datasets. Values for methane (CH4), nitrous oxide (N2O) and fluorinated gases cover all sectors, including LULUCF, and come from the PIK database. Values for CO2 from LULUCF also come from the PIK database. The remaining values come from the EDGAR CO2 emissions database, downloaded from the website OpenClimateData. The EDGAR categories described in full are as follows: Buildings (non-industrial stationary combustion: includes residential and commercial combustion activities); Transport (mobile combustion: road and rail and ship and aviation); Non-combustion (industrial process emissions and agriculture and waste); Industry (industrial combustion outside power and heat generation, including combustion for industrial manufacturing and fuel production); Power & heat (power and heat generation plants). Originally published by Carbon Brief. Jocelyn holds an undergraduate masters in environmental chemistry from the University of Edinburgh and a science journalism MA from City University London. She previously worked at BusinessGreen covering low carbon policy and the green economy.